Below please see our wholesale button shanks and button covers and convertors. If your unfamiliar with the products I have an explanation at the bottom of the page. Button Shanks are meant to be glued or soldered on to an item, turning that item into an actual button or a decorative finding that can be sewn in place. You may think that one of our cameos would make a nice button so you could glue one of the shanks to it and attach that to a sweater. You can use anything that is size appropriate. Semi precious stones, I have people who are glass artists buy the shanks and also button collectors to repair or refurbish an antique button. 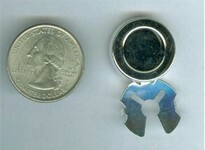 Button convertors are usually used to turn a button into something you can hang. 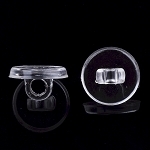 Button covers can be slid over a button to provide a decorative covering. The metal cover itself has a nice flat pad to glue something on like a cameo, stone or your own art work. Some people like to just wear a single cover on the top button ( at the throat ) others have a cover for every button on the outfit. Button covers are pretty simple not much to go wrong, Just make sure the button will fit into the button cover. If the button cover is sold as a 25mm cover it will not cover a 30mm button as the button diameter will be to big.